The fifth season premiere picks up exactly where we left off, with Team Flash celebrating the new addition to the family—a celebration that’s interrupted when another new addition to the family unexpectedly crashes the party. 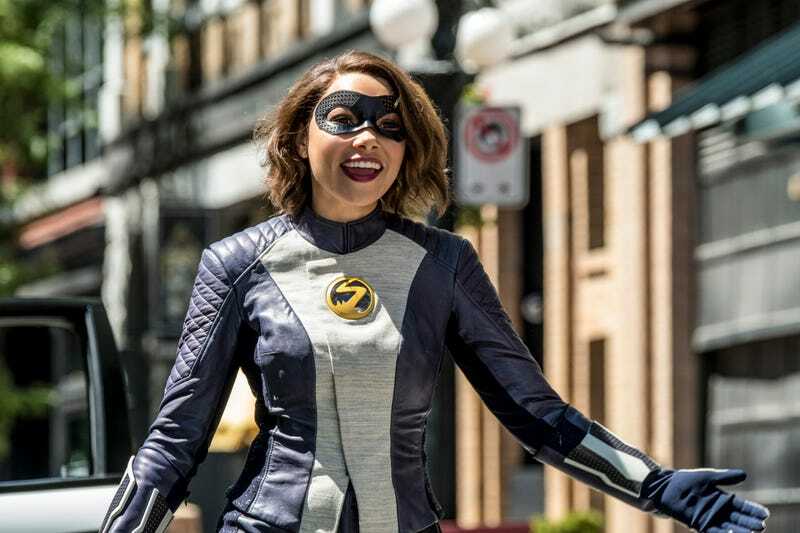 As you no doubt recall from the fourth season finale, this is Nora, future daughter of Barry and Iris, and a speedster in her own right. Known as XS in her own time, she’s the one who turned up in time to help Barry redirect the satellite, which she says was a mistake since she now can’t go fast enough to enter the Speed Force and return to her own time. Nora is definitely Barry’s daughter—no need for 23andMe on this one. We’ve known her for five minutes and already she’s messing around time travel and the Speed Force and all those things a good speedster should know not to mess around with...but the Allens, they just can’t help themselves. In that respect, Jessica Parker Kennedy’s performance is perfectly balanced at the intersection of endearing and annoying. More annoying at first, truth be told, but that’s largely because the truth isn’t being told initially. Being confronted with your future daughter isn’t something that happens everyday, but Iris and Barry have been through enough weirdness by now that they accept Nora pretty quickly. (After all, her lightning is mix of yellow and purple, so why bother having Cisco run a DNA test he could probably do in his sleep? Or drunk, which he is.) The one rule they set is “no future talk,” but come on. This is Team Flash we’re talking about here. They stick to that for about five minutes and then pretty much hand-wave it away. After all, there’s a whole other CW-verse show where time travel is as commonplace as a trip to the convenience store, and as Wally knows from his adventures with the Legends, not all timeline changes are created equal. Still, remember Flashpoint? Remember Cisco’s brother and all that angst? Remember all those solemn vows to...oh, forget it. These people never learn anything, and how fun would it be if they actually stuck to their guns on this one anyway? So it is that Iris takes Nora out to Jitters to question her about the future, and is disappointed to learn that her daughter will not follow in her footsteps and become a reporter, and that their relationship as adults is not so great. And so it is that Barry asks what part he plays in Nora’s future, and learns that it’s not much of one at all. Remember the future headline Gideon showed Wells way back at the beginning of the series? Well, the Crisis is still in play, and the Flash still goes missing in it. For at least 25 years. Given that revelation, why not let Nora stick around a while longer to get a little quality time with the Dad she’s never known, and who knows, maybe help Barry find a way to avert his Crisis fate. Meanwhile, there’s a meta-of-the-week to be dealt with: Gridlock, who absorbs kinetic energy, making it impossible to do any damage by hitting him. He’s pretty disposable as villains go, although the method Team Flash comes up with to deal with him is clever enough, and their rescue of the plane by phasing it through the buildings in its path is suitably epic, in a “CW special effects” sort of way. I’ve been doing this long enough to know better than to make any big proclamations about what this premiere suggests for the season as a whole. 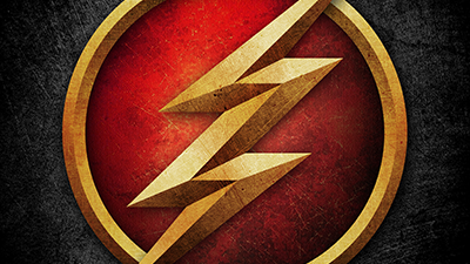 (Remember last year was going to be a return to the “early, funny Flash”? And then we got the most dour, joyless big bad yet?) It’s a solid start, and it’s always fun to see the gang again after a few months off, and that’s good enough for now. Ralph does raise a good point that I’m sure I’ve seen in the comments here: Why didn’t Eddie Thawne just get a vasectomy to prevent the birth of Eobard? Wally decides to return to the Legends to continue his journey, which sounds like a great idea, except that Keiynan Lonsdale has announced that he won’t be a series regular on either show going forward. Expect a brief stint aboard the Waverider and occasional guest appearances going forward. That big bad we glimpse at the end is Cicada, but I’ll say no more than that for those who prefer to remain in the dark on such matters. On the annoying side of the ledger for Nora: “Shway.” Please, no more shway. All this time, STAR Labs has had a napping lounge. Poor Joe, his cover is blown. Nora spoils a future fight between King Shark and Gorilla Grodd and I MUST HAVE IT IMMEDIATELY.